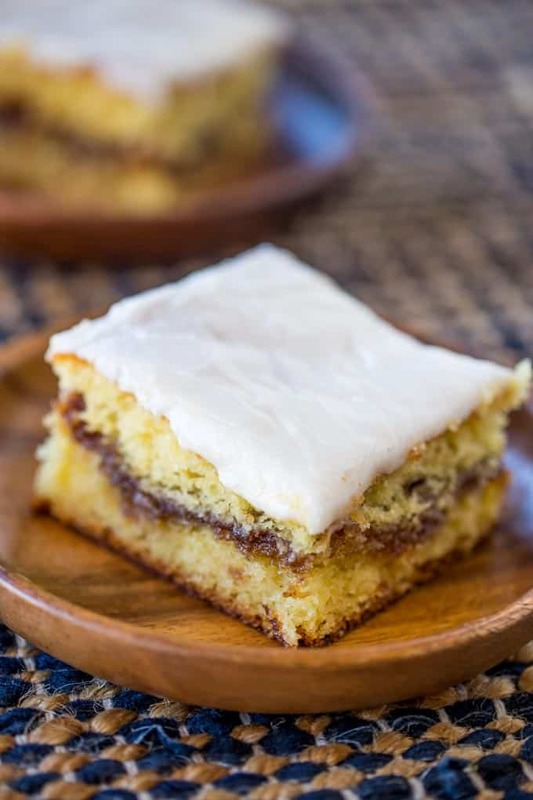 Honey Bun Cake with no cake mix, tastes like the classic yellow honey bun cake with brown sugar filling topped with rich icing made famous by Betty Crocker that you loved as a kid growing up. This cake is winning the war for best Easter cake out there right now against the other heavy contenders including Ultimate Carrot Cake (with Carrot Cake Jam), Classic Carrot Cake, Classic Coconut Cake and the dark horse non-cake but still “cake” Flourless Chocolate Cake. Honey Bun Cake reminds me of the classic American convenience store honey bun pastries that were like cinnamon rolls in a pinch. I also used to be able to buy them in the student store in junior high school. I don’t even know why, but the flavors are so nostalgic that as I was browsing through Pinterest, I felt a pressing need to make this sheet cake right away. Speaking of which I recreated another junior high favorite, Frito Pie and it is even better than the nostalgia I remember as a kid. 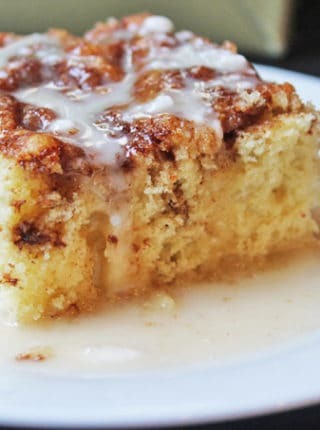 Most Honey Bun Cake pins on Pinterest use a cake mix as the main ingredient. While I love my Boxed Cake Mix Hack: Tastes like you paid $6 a slice! I wanted to use a cake from scratch for this cake. With extra egg yolks in the cake to help bring out that classic yellow cake color, this cake has the most amazing flavor. Pre-heat the oven to 350 degrees and spray a 9×13 pan with baking spray. Using an electric mixer, mix together the cake mix, oil, eggs and sour cream until well combined, then pour half of it into the pan. 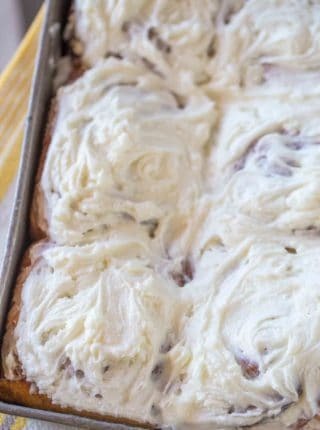 Whisk together the pecans, cinnamon and brown sugar and sprinkle the sugar mixture all over the cake batter then gently spoon over the remaining batter evenly and bake for 45 minutes. When the cake comes out prick the top with a fork 15 or so times, then whisk together the powdered sugar, milk and vanilla and pour it over the warm cake. Most glazes were also pretty thin in the recipes I saw so I used my thick glaze recipe to provide that same texture and consistency found on the classic Honey Bun pastry. I have to say after testing it out both ways, I’m pretty satisfied with this layer of delicious powdered sugar glaze. 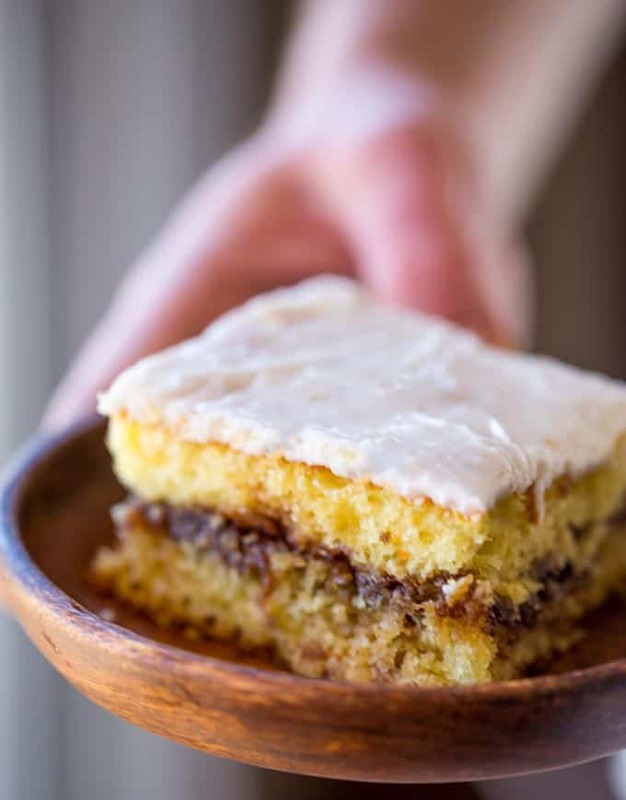 The brown sugar filling is another important part of this cake you absolutely cannot skip. Whether or not you make my homemade version below or the classic boxed mix version above you have to make sure there is a delicious molten brown sugar filling through the middle of your buttery cake. 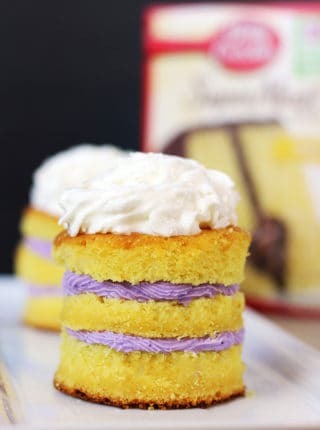 If using a cake mix make sure to use yellow cake, the extra egg adds richness to the cake. 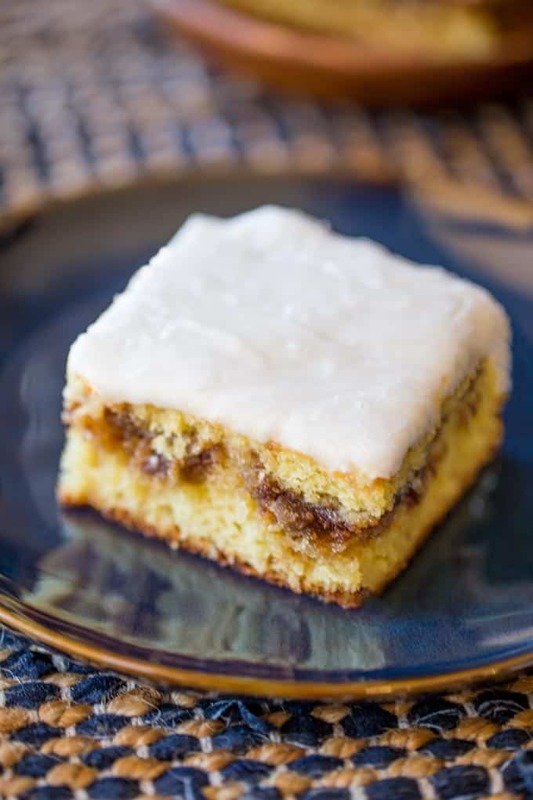 Try not to replace too much of the vegetable oil with applesauce in this cake, the texture will become too fluffy and unlike the classic Honey Bun texture. Honey Bun Cake with no cake mix, tastes like the classic honey buns you loved as a kid and like your favorite yellow cake growing up. Perfect for brunch and holiday parties. This recipe is best served during a brunch gathering, so recipes like Breakfast Casserole, Quiche Lorraine, French Toast or Classic Egg Salad and Classic Chicken Salad sandwiches. Preheat oven to 350 degrees. Spray a 9x9 inch baking pan with baking spray. In your stand mixer, mix the softened butter, sour cream, vegetable oil, vanilla and eggs until fully combined and lightened then add in the flour, sugar and baking powder on low speed. Pour 1/2 of the batter in the bottom of the baking pan and spread. In a small bowl mix the brown sugar, cinnamon and pecans and sprinkle over the cake batter in the baking pan. Add in the remaining half of the batter carefully and bake for 45 minutes until the top is just golden brown. Combine the powdered sugar, milk and vanilla, poke the cake with a fork 10-15 times and and pour over the cake then let cool completely. Is it supposed to be 2 eggs plus 2 egg yolks or just 2 egg yolks? Ingredients are different from instructions. So sorry for the confusion. You’ll want to add the eggs and the egg yolks in with step 2. Hope this helps! 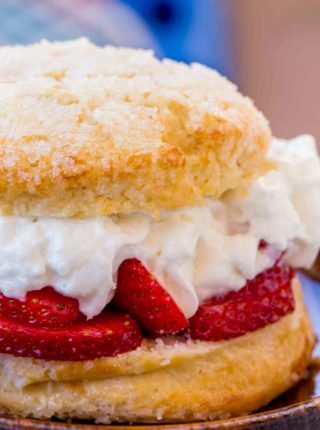 This looks yum! Could I use a round 8 inch tin for this recipe? I think a 10 inch round pan might be a better fit for this cake. Enjoy! Can’t wait to make this for our Sunday school class. So glad no cake mix is used. Everything I bake is from scratch. So much better for us without all the artificial stuff. This looks so good! Does elevation play into this? I’m finding many recipes don’t turn out right regardless of following the recipe to the T.
If you’re above 5000 feet, usually you’ll need to make adjustments to compensate. Yes, it will be fine for a bundt pan but you’ll want to follow the traditional cook time using that pan. No need to double it. I made this last night for my kids. They liked it a lot. The icing was a little too thin so next time I’ll only do 2 tbsp of milk instead of 3. It had a coffee cake texture and was very tasty. I’ll make this again. Thank you. So glad you all enjoyed it! Absolutely wonderful. I didn’t have powdered sugar for the icing so had to substitute. 1 tsp of cornstarch for each cup of sugar blended in a bullet blender. Can’t use a food processor for this. It turned out great. Thanks for sharing this recipe. When I tried the recipe, my batter was a bit bland? What was I missing? Nostalgia city! So motivated to make this. Thank you for helping me recreate a bit of my childhood! Recipe looks delicious. If I use a 9×13 pan should I increase the ingredients by 1/3 ?? THIS WAS GREAT MY WHOLE FAMILY LOVED IT. Another fantastic recipe Sabrina, I just made this last night and it was amazing. I don’t have any vegetable oil so I used canola oil and it turned out great. I have your website bookmarked because your site is so awesome. No more wondering what’s for dinner thanks again!!!!! Love it!! Thanks for dropping by to let me know! I’m so glad you enjoyed it! So parchment paper should be in the ingredient list. I CANNOT get this cake out of the pan. My family loved it anyway. Baked it twice in one day. I’m so sorry you had trouble getting it out of the pan 🙁 I do recommend spraying the pan down with baking spray but depending on what type of pan is used, parchment paper can never hurt! Glad you were still able to enjoy it! Twice in one day sounds like a perfect way to spend the day!! what are the measurements for a “stick of butter” in tablespoon ? A stick of butter is equivalent to 1/2 cup. So glad you found this recipe! Nostalgic treats are the best! So sorry, looks like there was a glitch in my recipe plug in. It’s 1/4 cup of vegetable oil and 1 stick of butter (softened). I edited so hopefully it shows up correctly now. Thanks for letting me know. I’m uncertain what you mean by this? “1 1/2 sticks butter 1/2 cup, softened” Do you mean 4oz (1/2 cup) or 6oz (1 & 1/2 sticks here in the US) of butter? I’m assuming all the butter is softened, based on the directions. Or is some of the butter softened and some not? Please help! So sorry about the confusion. There was a glitch in the recipe plug in. It should read 1 stick of butter, softened. the instruction call for vegetable oil but the indigents don’t call for any vegetable oil, how much is needed. I’m so sorry about the confusion. It seems my recipe plug in had a glitch. It should read 1/4 cup vegetable oil. I edited it so hopefully it shows up correctly now. what size pan did you use? You say in tools used 9×13 pan but then in the instructions you say 9×9 pan – which is it? Sorry about that. A 9×9 pan is what I used. I updated it as to clear up the confusion. Thank you for letting me know! 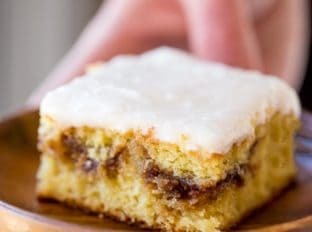 What an amazing snack cake!! Honey Buns have always been my favorite! I’m drooling over this cake! You list a 9×13 pan for the “tools used” for this recipe, but in the directions, you say to use a 9×9 pan. Which one should I use? Thanks! Sorry about that, I would stick to the 9×9, I will update the tools used section. 🙂 Thank you for letting me know! If I doubled this recipe…how much longer would I bake it? I plan on using my family as Guinea pigs lol. I love it but never made it. It depends on the type of pan you’ll be using because you’ll want to base the bake time on the pan. If you’re making two cakes in two separate pans at the same time, you may need at add 5-10 mins more. Hope this helps! Oh WOW!! What an incredible dessert!! Why ARE YOU NOT fat? This looks amazing! What a perfect dessert! With a recipe as easy and delicious looking as this, there is no need for a cake mix hack. This looks fantastic! No vegetable oil in the ingredient list, but listed in the instructions? Ugh, your comment was stuck in my spam folder 🙁 Sorry about the delay. I corrected the recipe plug in. You should use 1/4 cup of vegetable oil. OMG, I am so making this soon!! Holy delicious! I cannot wait to try this!